SUPPORT VIB SUPPORTER BUSY BEAVER BUTTON CO.! It takes a lot of handouts to keep the VIB on the minds of our fans throughout the year. We've given away everything from paper Viking helmets to custom made "Silly Putty," but every year the most sought after give-aways are buttons. Once again, our friends at Chicago's Busy Beaver Button Co. have graciously taken on the task of making a big chunk of those buttons. You'll have to come see us to get one! You can always get your very own awesome buttons. Click here to check it out. 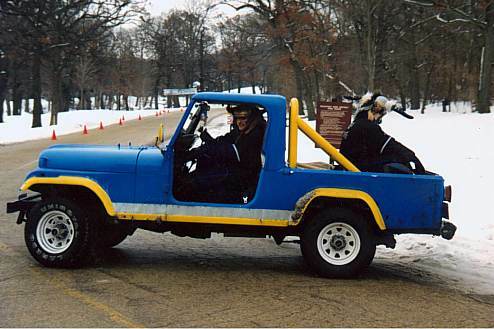 A loooooong time ago the VIB drove around in the LongJeep. We still have it. It's a little worse for wear, but she will sail again! 1991: Illinois Snow Sculpting Competition: Third Place "The Graduate"
United States National Snow Sculpting Competition: "The Madonna"
1993: Illinois Snow Sculpting Competition: "Gargoyle"
1994: Illinois Snow Sculpting Competition: Second Place "Mjolnir"
1995: Illinois Snow Sculpting Competition: First Place "John Henry"
United States National Snow Sculpting Competition : Fifth Place "Death of Cleopatra"
"Tarzan: The Death of Kerchak"
United States National Snow Sculpting Competition: "Le Succube"
1997: Illinois Snow Sculpting Competition: First Place "Keokuk." United States National Snow Sculpting Competition: "Who Are You?" 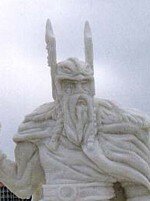 1998: Illinois Snow Sculpting Competition: International Peoples' Choice "King Conan"
1999: Illinois Snow Sculpting Competition: Third Place "Perseus Presents Medusa"
United States National Snow Sculpting Competition: "Hercules At Hades"
2000: Illinois Snow Sculpting Competition: Third Place "Vagen til Valhalla"
United States National Snow Sculpting Competition: "The Huldra"
2001: Illinois Snow Sculpting Competition: "Lewis Lemon"
2002: Illinois Snow Sculpting Competition: Honorable Mention "Sweetness"
2003: Illinois Snow Sculpting Competition cancelled. United States National Snow Sculpting Competition: "Peace Of Mind"
2004: Illinois Snow Sculpting Competition: First Place "Progress"
2005: Illinois Snow Sculpting Competition: International Peoples' Choice "Super Grover"
United States National Snow Sculpting Competition: "Perseverance"
2006: Illinois Snow Sculpting Competition: Peoples' Choice & Fourth Place "Priorities"
2007: Illinois Snow Sculpting Competition: First Place "The Crusher"
2008: Illinois Snow Sculpting Competition cancelled. United States National Snow Sculpting Competition: "Sleipnir"
2009: Illinois Snow Sculpting Competition: Third Place "The Dark Knight"
2010: Illinois Snow Sculpting Competition: Second Place "Vagen til Valhalla II"
2011: Illinois Snow Sculpting Competition: Peoples' Choice and Second Place "Astrapaios"
2012: Illinois Snow Sculpting Competition: Peoples' Choice and First Place "Pocahontas"
United States National Snow Sculpting Competition: "The Lookout"
2013: Illinois Snow Sculpting Competition cancelled due to lack of snow. United States National Snow Sculpting Competition: "Oh, Yes We Kraken!" United States National Snow Sculpting Competition: "Fish & Ships"
United States National Snow Sculpting Competition: "Sampson at Gaza"
We are the VIB: Svenhärd, Thorfinn, and Bjorn, three half-Swedish brothers originally from Roscoe, Illinois. We were raised by Karin and George Skupien (sponsors and huge supporters) to be dedicated to our work but to never forget to have fun doing it. In 1993, Bob Belt left the team and was replaced by another brother, Bjorn. The team began wearing matching grey coveralls and we were unofficially dubbed "The Sewer Workers" by fellow state sculptors. In 1994, we donned all black snow suits and face masks and became "The Ninja Sculptors" (again a name given by other sculptors). That year's sculpture "Mjolnir" (depicting the Norse god Thor) won us a Second Place state award and a return trip to Nationals (where we have been sneaking in every chance we get ever since). That year we also began the tradition of handing out bottles of "Bjorn's Bitchin' Glug." 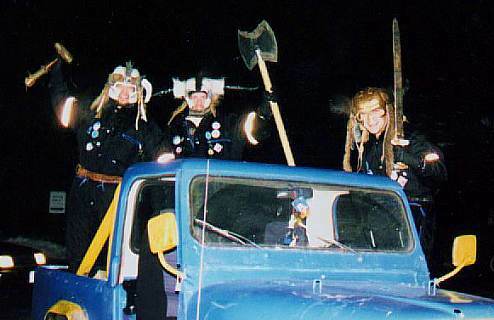 The following year we officially became The Mighty Morphin' Swedish Mutant Ninja Sculptors and donned our now infamous Viking helmets. A couple years later we changed our name because little kids just didn't understand the joke anymore and we permanently became the Vikings In Black. 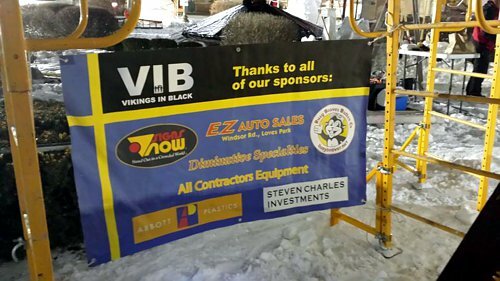 The VIB is now one of the oldest snow sculpting teams in existence with the same team members. We don’t plan on stopping. If you would like to become a sponsor please contact Sven at svenhard(at)gmail.com.